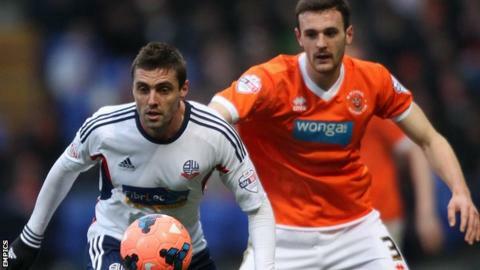 Manager Dougie Freedman says Nottingham Forest hope to sign ex-Crystal Palace midfielder Andre Moritz next week. Brazil-born Moritz, 29, played under Freedman at Palace, helping them win promotion to the Premier League in 2012-13, and he also followed the now Reds boss to Bolton Wanderers. He is currently playing for Buriram United in the Thai Premier League. "It's still with the governing bodies to see if he can sign," Freedman told told BBC Radio Nottingham. "We are desperately trying to do it. It's a position that we need." Moritz joined Palace in August 2012, scoring five goals in a 32 appearances, but just 13 of those were starts. He joined Bolton the following season, finding the net seven times in eight starts and a total of 27 appearances. Freedman added: "As we speak it's with Fifa and the Football Association to see if we can have the go-ahead. We want it to be done quicker. "He is a left-footed, very gifted player. He's in good shape. He is a goalscoring, attack-minded midfield number 10 that I think we could do with."